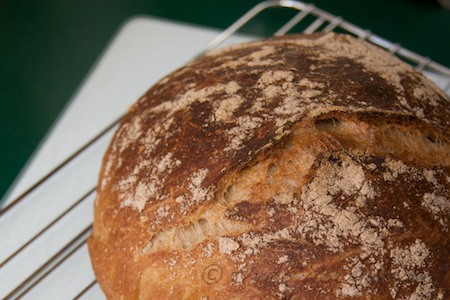 My first real experience with homemade bread was no-knead bread was over two and half years ago. I found it terribly sticky & very difficult to work with every time I tried it, and I gave up and haven’t tried again in a very long time. 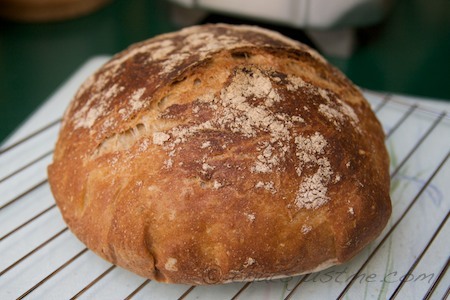 I stopped messing with no-knead, and concentrated on mixing my bread dough with the bread machine. But I’ve been getting bored with my bread lately, wanting a more “artisan” bread, so last night, I decided to give no-knead one more shot. After almost 3 years of dough-handling experience, you’d think it would be a piece of cake, right? Yes, it’s still a super sticky mess, but I’ve learned over the years, that water, not flour is the key for handling dough. I always make sure my (clean) hands are wet, and I’ve found it’s a lot easier to shape my bread loaves. I admit, this dough is way more stickier than normal and still difficult to handle, but I did it! Whisk dry flour, salt and yeast together in large bowl. Add water and using a wooden spoon, mix until blended – the original recipe suggests 1-5/8 cups of water (which translates to 1-1/2 +2Tbsp of water) – I found it wasn’t enough so I added more water to ensure it was a “shaggy mess” of dough. Cover with plastic wrap, and allow to sit, undisturbed for at least 12 hours. The dough will expand and become bubbly. After its all-day or overnight rest, using wet hands, sweep and scoop the dough from the edges of the bowl. It’s going to be a sticky, hard-to-handle mess, but do your best. Wet hands again, and carefully pick up dough, shaping it into a round loaf. Place it (flat) on a large piece of parchment paper. 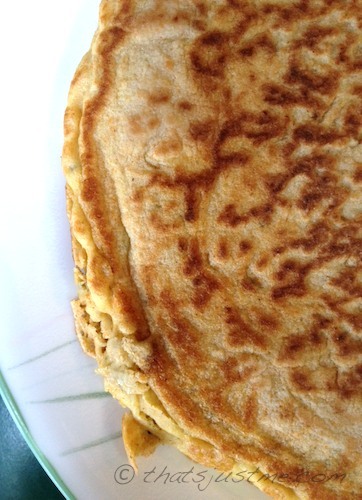 Lightly sprinkle a little flour (whole wheat or white) on top. Allow to rest/proof for 1-1/2 to 2 hours. Carefully remove hot pot and gently transfer the dough to the pot, keeping the parchment under the dough and in the pot. Cover and bake for 20-30 minutes, then uncover and bake for another 15-20 minutes. I baked for 20 minutes covered, and 20 minutes uncovered. Remove bread from pot, allow to cool on rack, then eat and enjoy! I’ll probably try 2 cups of whole wheat and 1 cup of AP flour next, and eventually work up to 2-1/2 WW & 1/2 cup AP. I know I messed with 100% whole wheat no-knead breads in the past, and it really wasn’t great, but I wasn’t as experienced, so we’ll see how it goes. 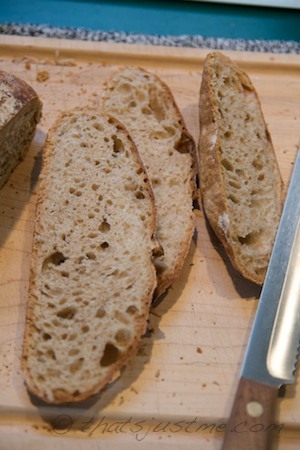 UPDATE 2013/02/13: I’ve tried 1 cup AP flour and 2 cups whole wheat and it makes a denser loaf. I’m happier with a 50/50 mix but I’ll keep experimenting. 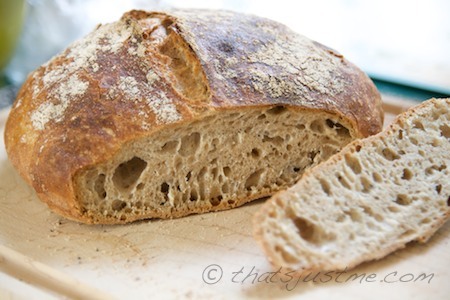 I’ve also found that its easier to keep a tighter bread shape when I use my 2 quart cast iron pot for proofing (with parchment) and then transfer the dough with the parchment to my larger 4 quart cast iron. It helps keep the bread from spreading out while it’s proofing. I made tuna sandwiches for lunch and the bread was soft with a chewy crust! Delicious! Thanks to Eating Rules, I found this cool project on Kickstarter, so I kicked in a couple of bucks. It’s a wonderful idea, using fish waste water to fertilize the plants! I love that they want to manufacturer in US, and they really seem to care about the quality of the product. I know I’ve seen their mushroom boxes at Whole Foods. I admit it was always a bit too expensive for my budget, but someday, I might splurge! The Navels are Here! The Navels are Here! I stopped at the grocery to get a couple random items, and I was so excited to see bags of California navel oranges! Of course I grabbed a bag. I adore CA Navels, I think they are my favorite fruit! I miss eating oranges in the summer, by November/December, I’m struggling through “citrus withdrawals” – I count the days until they are in season again! Whoo hoooooo! I think they seem early this year, but I won’t complain! Author debbie @ That's Just MePosted on November 15, 2012 Categories FoodTags California navel oranges, citrus, FOOD, fruit, healthy, oranges1 Comment on The Navels are Here! The Navels are Here! The other day, I phoned my local bank to complain about their new online banking interface. Since the change, I’ve found it very user-UNfrendly and wanted to express my views. Then the recent Saturday Night Live skit kept popping into my head. You know, the one where the tech reporters were confronted/humiliated by the Chinese iPhone peasant workers. It was hilarious and sad at the same time. The skit exaggerates some recent iPhone complaints (like the iPhone is too thin and too light) – and then brought out the factory workers who proceeded to put the tech reporters in their place, for being so petty. In case you didn’t see it, here’s a link. Anyway, the point of this post is my revelation. Am I so jaded and spoiled that I can’t recognize and appreciate the awesomeness that is online banking? I can save gas and time, forgoing a trip to a physical bank branch and actually pay bills, transfer money, check my banking balances and view transactions. Why am I complaining??? I’m grateful that there are so many wonderful technologies at my disposal, making my life easier! I need to stop and find appreciation in the gifts I’ve been given! November is the perfect time to give thanks. I started a separate Gratitude Blog a couple of years ago but I don’t post very often. I figured this month it would be a good to once a day, pause, and feel a moment of gratitude for something wonderful in my life that day or week. I might not be able to blog every day, but I’m going to set an alarm on my phone for a gratitude moment. To start off today, I am so very grateful to live in a community with many awesome public libraries that offer free access to as many books that I can handle! I found a new (for me) library in Methuen today, as I was closeby picking up apples at a local farm. The library is beautiful and I found a bunch of wonderful cookbooks to borrow. This week, I spent $100.19, for a grand monthly total of $397.23. My final yearly total is $4821.97. So this is it! 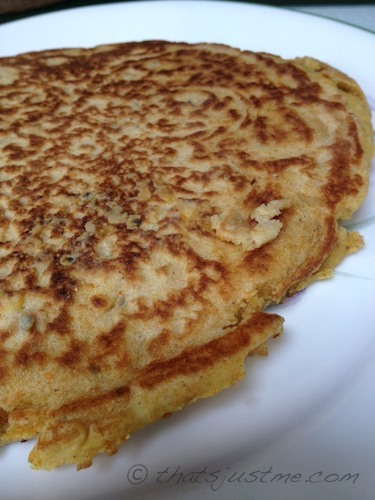 The last week of the last month of my year of conscious food budgeting! I learned so much SOOO MUCH this year! It’s still an ongoing process, but really, I’m quite proud of how much I accomplished in the last 12 months. I found that meal planning (on my iPad using the “Notes” app) helped tremendously, as did making a strict shopping list. I use the Shopper iPhone app to write my lists and track item pricing. I set a goal for each store, and tried very hard to stick to it. There were a few impulse add-ons, but I also put a lot of items back on the store shelves that I didn’t necessarily need that week. So, how much has changed? Well, last year (Nov 2010 to Oct 2011), I spent over $7,000 for food! $500-$700 per month! This year, I cut my food spending to $4822, and I am thrilled! I’m hoping to keep up my $400 monthly budget for the next year too. Interesting, Whole Foods has a strong lead at 33%, but compared to 64% last year, I’ve really reduced my spending there, buying more from local farms, Market Basket and Trader Joe’s. I certainly will continue to keep on my budget. Publicly posting actually helped me keep me accountable, so I don’t want to stop updates, but I might post monthly summaries instead of weekly. We’ll see how it goes.